Introduction to the Sunday Reading. The Gospel for this Sunday contains two passages, not related or directly connected. The first is the Prologue to Luke’s writings (Lk. 1: 1-4), the second (Lk. 4: 14-21) which gives the first recorded words in this Gospel. 1 Inasmuch as many have undertaken to compile a narrative of the things which have been accomplished among us, 2 just as they were delivered to us by those who from the beginning were eyewitnesses and ministers of the word, 3 it seemed good to me also, having followed all things closely for some time past, to write an orderly account for you, most excellent The–oph’ilus, 4 that you may know the truth concerning the things of which you have been informed. The first four verses in Luke’s Gospel are known as the Prologue or Preface. They form a single sentence of six lines and are written in classical style to give a literary importance to the content of what follows. This Prologue introduces the Gospel and the Acts of the Apostles, both written by Luke. Luke is the only synoptic writer who has written a prologue. It is very short and very elegantly written, describing why he has written the two books, the Gospel of Jesus Christ which is the selected Gospel at proclaimed at Mass this year and the Acts of the Apostles. — to provide an orderly account of the life of Christ, starting at the beginning. John also wrote a Prologue which is really a summary of what his Gospel contains. s many have undertaken to compile a narrative of the things which have been accomplished among us, 2 just as they were delivered to us by those who from the beginning were eyewitnesses and ministers of the word, 3 it seemed good to me also, having followed all things closely for some time past, to write an orderly account for you, most excellent The–oph’ilus, 4 that you may know the truth concerning the things of which you have been informed. “Inasmuch as many have undertaken to compile a narrative of the things which have been accomplished among us” — We are not aware of “the many” who had written narratives about Christ and his accomplishments in word and deed. Mark is the only one that has survived. While Mark wrote his Gospel before Luke undertook his, Matthew and John were later than Luke. “the things which had been accomplished among us” — This refers to the will of God as revealed in the Old Testament and which Jesus accomplished in word and deed. He fulfilled the scriptures perfectly, as Luke will show. “among us” — This expression shows that the things Jesus said and did are still taking place and Luke is writing about them. This refers to the Acts of the Apostles which were still been fulfilled at the time of writing. “just as they were delivered to us by those who from the beginning were eyewitnesses and ministers of the word” — “Eyewitnesses and ministers of the word” means more than the spoken or written word; it applies to the deeds or actions which were seen or served in and by Jesus. Luke does not identify the “eyewitnesses or ministers” but he acknowledges that they were among the first disciples. They would have included Mary, the Apostles and others who shared Jesus’ life. “it seemed good to me also, having followed all things closely for some time past, to write an orderly account” — Luke seems to criticize the other authors prior to him because, having studied the matter most carefully, he implies that their accounts were not “orderly” and so not trustworthy. “for you, most excellent The–oph’ilus” — indicates that this man was one of social standing probably a Government official. “Theophilus” means ‘one loved by God’. Luke tells him that he will learn nothing new in this account. He would have heard the contents of Luke’s Gospel preached beforehand since that was the first method of communication. What Luke is doing is to guarantee the truth of what he writes. In this way Theophilus and other readers will have a divine and permanent record of the words and deeds of Jesus and the early Church. “that you may know the truth” — Jesus preached and performed deeds that over the years became obscured in some quarters. Luke’s Gospel is to make the words and deeds of Jesus clear and his readers will then be in a position to judge whether what they were taught was correct. “concerning the things of which you have been informed” — The Greek word for “informed” is the same as ‘catechised’. Theophilus was converted and instructed (catechised); now he will see how his instructions accord with the words and deeds of Jesus..
(i) He addresses himself to a leading person in the community, probably a Government official. Nothing is known about Theophilus but it is surmised that he was wealthy and it was presumed that when he received his copy he would have other copies made and circulated, as wealthy people did at the time. (ii) Luke claims to be a careful, accurate and reliable narrator of the events he will write about. (iii) His sources for writing were people who had personal contact with Jesus and who followed him as disciples. The living word that they received was still alive, had been passed on and this was the content of Luke’s writings. The word of God continued in the Church and its different communities. (iv) Having perused Luke’s Gospel, Theophilus would be confirmed in his faith. 16 And he came to Nazareth, where he had been brought up; and he went to the synagogue, as his custom was, on the Sabbath day. And he stood up to read; 17 and there was given to him the book of the prophet Isaiah. “And Jesus returned in the power of the Spirit into Galilee” — Jesus had gone to the River Jordan and been baptised. Then, led by the Spirit, he went into the wilderness and was tempted by the devil. Now he returns to Galilee and commences his public ministry. This will continue to Lk. 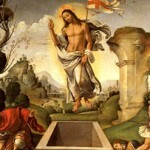 9: 50 after which he will begin his journey to Jerusalem and death. “in the power of the Spirit” — This is a major theme in Luke’s Gospel; everything Jesus said or did was under the influence and working of the Holy Spirit who had anointed him at his baptism. “and a report concerning him went out through all the surrounding country” — This strikes a note of universality, a frequent theme in Luke. His message was well received and talked about favourably. 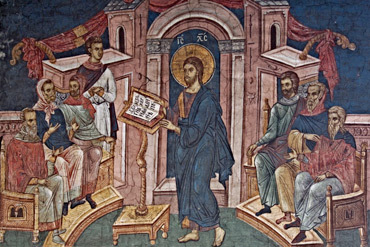 “And he taught in their synagogues” — That Jesus teaches is mentioned fourteen times in Luke’s Gospel (Lk. 4: 15, 31’ 5: 3, 17; 6: 6; 11: 1; 13: 10, 22, 26; 19: 47; 20: 1, 21; 21: 37; 23: 5). He is called “teacher” thirteen times (Lk. 7: 40; 8: 49; 9: 38; 10: 25;11: 45; 12: 13; 18: 18; 19: 39; 20: 21, 28; 39; 21: 7; 22: 11). He is called “master” six times (Lk. 5: 5; 8: 24; 9: 33, 49: 17: 13). Obviously Jesus’ teaching mission is regarded as of major important by Luke. “being glorified by all” — This reaction of the people is a most frequent theme in this Gospel (5: 25–26; 7: 16; 9: 43; 13: 13; 17: 11; 18: 41; 23: 47). Luke is showing how Jesus was accepted by the various centres and people were high in their praises of him. The note of universality is mentioned twice: a report about him went through all the country and all glorified him. Later in this chapter the people of Nazareth, after first accepting him, will reject him. Luke wishes to contrast how people other than his own accepted him wholeheartedly. “And he came to Nazareth, where he had been brought up” — This is his first visit to his home–town Nazareth after his baptism and temptation. This is also Luke’s first recorded public message by Jesus. “and he went to the synagogue, as his custom was, on the Sabbath day” — The synagogue was a meeting place for the Jewish religion. Luke portrayed Mary and Joseph as devout Jews. Now he shows that Jesus also was devout and had the habit of going to the synagogue. On the Sabbath, all pious Jews went there for prayers and mostly the proclamation of the Book of the Law (the first five books of their scriptures, the Old Testament), and the Prophets, which included the historical books. The President would invite one of the participants whom he knew to be well versed in scripture, to read and explain. Because of his reputation (v. 14) Jesus may have been invited to deliver the proclamation. “And he stood up to read; and there was given to him the book of the prophet Isaiah” — A person present could volunteer to read and explain the passage of scripture. This could have happened when Jesus attended on this occasion: he may have volunteered by standing “up to read”. He opened the book and found the place where it was written, 18 “The Spirit of the Lord is upon me, because he has anointed me to preach good news to the poor. He has sent me to proclaim release to the captives and recovering of sight to the blind, to set at liberty those who are oppressed, 19 to proclaim the acceptable year of the Lord.” 20 And he closed the book, and gave it back to the attendant, and sat down; and the eyes of all in the synagogue were fixed on him. “He opened the book and found the place where it was written” — The quotation is from Is. 61: 1–2. “‘The Spirit of the Lord is upon me” — This is a reference to the Holy Spirit, God the Father and the incarnate Son: “Spirit”, “Lord” and “me”. “‘because he has anointed me’” — The Holy Spirit descended in the form of a dove on Jesus and anointed him at his baptism (Lk. 3: 31–32). “This anointing of Jesus Christ was not an anointing of the body as in the case of the ancient kings, priests and prophets; rather it was entirely spiritual and divine, because the fullness of the Godhead dwells in Him substantially” (St. Pius X Catechism, 77). “‘to preach good news to the poor’” — Jesus will explain to the followers of John the Baptist, when they will come to him, that this is one of the ways in which he manifests his messianic mission (Lk. 7: 22). “‘He has sent me to proclaim release to the captives” — The Greek word used here means release from sin which held them as prisoners. “and recovering of sight to the blind, to set at liberty those who are oppressed, to proclaim the acceptable year of the Lord’” — Each of these would be a part of the preaching of the Messiah. “to set at liberty those who are oppressed” — Once again, the Greek term used here refers to liberating sinners because they are oppressed by their sins. “to proclaim the acceptable year of the Lord’” — The “acceptable year of the Lord” was a Jubilee Year. It occurred every fifty years and was meant to symbolise the mercy and liberation people would enjoy in the Messianic age. Based on Lv. 25: 8–55 this Jubilee Year was a time when all debts were forgiven, all loans and possessions were returned to their original owners from those who held them for one reason or another. The principle was that God owned everything and people held his creation on loan. If others acquired it from them, these had to restore it during the Jubilee Year. The Catholic Church continues this Jubilee Year custom by celebrating “holy years”. “And he closed the book, and gave it back to the attendant, and sat down” — Rabbis and other teachers sat to instruct. Then he began to say to them, “Today this scripture has been fulfilled in your hearing.” — Jesus claims to be the Messiah. This is the inauguration of the Good News according to Luke (The Catechism of Catholic Church, 714). “Today” is a very special word for Luke. It does not refer to the particular day or date when Jesus spoke in the synagogue. It refers to the time of fulfilment of the promises made by God regarding the future Messiah. Jesus says that “today”, in this era, in me, those promises are being fulfilled. These promises are not being fulfilled in a once–only occasion; they are continuing in an era, this the final era of the world. After his preparation for his public ministry by baptism and temptation, Jesus goes to his home–town Nazareth and informs the people in their synagogue that he is the long–expected Messiah. After the fall of our first parents, God did not abandon his newly created people. Genesis (3: 14–15) records, “The Lord God said to the serpent, “Because you have done this, cursed are you among all animals and among all wild creatures; upon your belly you shall go, and dust you shall eat all the days of your life. I will put enmity between you and the woman, and between your offspring and hers; he will strike your head, and you will strike his heel.” These words are known as the Protoevangelium, the first Gospel or Good News, where God promises to redeem mankind. As time advanced the Bible developed that first promise and people were taught to expect the Messiah and a new Spirit. The word “Messiah” means the One anointed with God’s Spirit. “Messiah” in Greek is “Christ” and in English is “Anointed”. Certain other people were anointed in the Old Testament: priests, kings and prophets. And so the One anointing with the Holy Spirit would be God the Father, anointing his Incarnate Son as Priest, Prophet and King. We speak in English about Jesus Christ, meaning “Jesus the Christ”, “the Anointed One”. Or we speak about “Christ Jesus”, meaning “the Anointed Jesus”. “Christ” is a title for Jesus, not a proper name. This explains Luke’s predilection for speaking of Jesus doing something or going somewhere “in the power of the Spirit”. It also explains why he promised to send the Spirit on his Church after his resurrection and ascension. In the Old Testament, particularly in the Book of Isaiah, another thought became indelibly associated with the Messiah, that of suffering. In Isaiah there are four “Suffering Servant Songs”. These apply to the Passion of Jesus when he will suffer die and pour out his Spirit of life “on the many”. Two verses from one of these four songs (Is. 61: 1–2) are quoted in today’s Gospel passage. Finally, a quote from the Book of Daniel: As I watched in the night visions, I saw one like a human being [like a son of man] coming with the clouds of heaven. And he came to the Ancient One [the Ancient of Days] and was presented before him. To him was given dominion and glory and kingship, that all peoples, nations, and languages should serve him. His dominion is an everlasting dominion that shall not pass away, and his kingship is one that shall never be destroyed” (Daniel 7: 14–15). This is a prophecy of Jesus the Christ (Messiah) seated at his Father’s right hand inaugurating his kingdom that will have no end.